Our customer was yelling at me, angry that the product we had sold her wasn’t “right.” She was accusing us of cutting corners, and changing the manufacturing process in a way that wasn’t possible, but from her perspective, she felt like we had broken her trust. I stood there listening to her anger, trying so hard to be present, while also controlling all the thoughts that were going through my head that wanted to argue and tell this woman that she was stupid and had no clue what she was talking about. I knew the process, because I was intimately aware of it. She didn’t. The surface conversation was about quality/process, but the real conversation was about trust. In the intensity of the moment, I couldn’t hear that this was really about trust. All I could hear was her complaints and accusations that we were doing things that I knew we weren’t doing. All I wanted was for her to go away, because I made a judgement call that nothing was going to resolve her concern (when you only hear the surface problem, and you know that it isn’t a problem, you can’t figure out a way to make things better). So I politely thanked her for her feedback, said I would look into it, and walked away. I gave her a white lie, because the truth wouldn’t be helpful in that moment. I could have explained that the process hasn’t changed in 10 years, and show her all the tools involved over that time, but I also knew that she wouldn’t believe me. I tried so hard not to get triggered into anger, but through the effort to control my reaction I could only see a few ways out of this situation. I chose a way out that had very little confrontation, which was a step of growth for me (in the past I would have argued with her, which would have only made things worse). But as a person I value honesty, integrity and quality: so how could I stand there and make a white lie when it was against everything I want to be as a leader and as a person? I let my short term desire for resolution win out over my values. This memory was triggered today as I was reading Weology, by Peter Aceto and Justin Kingsley. Peter Aceto is the CEO of Tangerine Bank. 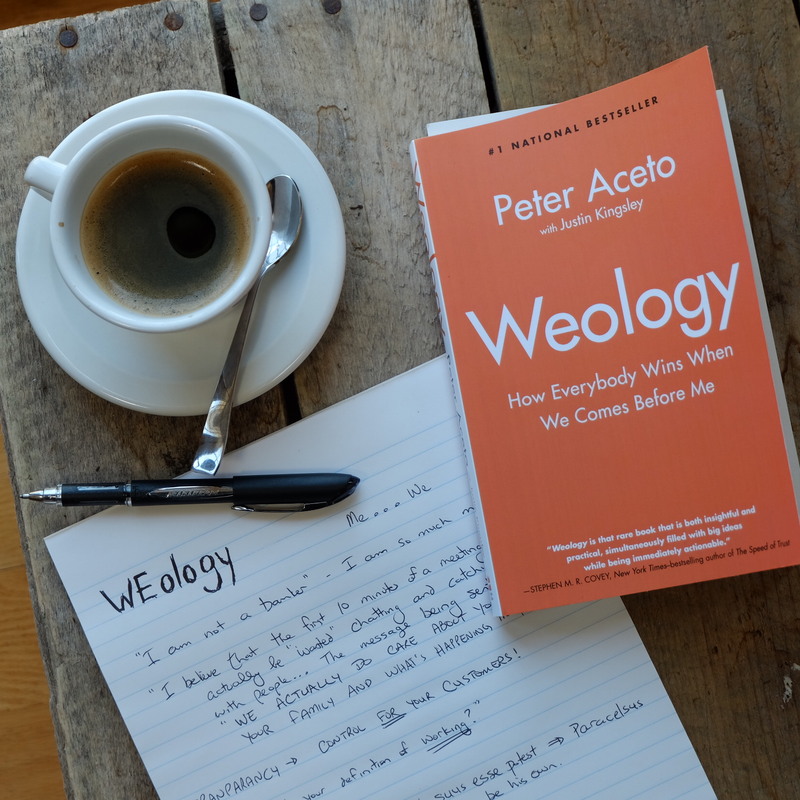 In one chapter, Aceto shares how as a leader we have to consider the culture we are creating for those working directly under us. I love conversations about work culture, and I wanted to read more about how he was going to share his methods of treating his staff in a way that made their lives better! He proceeds to share that much of that effort comes from being careful about what information he shares with his team. His point is that people have jobs to do with responsibilities to take care of, and they need the information that will serve that–but they don’t need to know everything because a lot of information is of no direct value and will only create worry and fear. I wouldn’t have been concerned about such a statement, except that a previous chapter had shared the importance of transparency–so now he’s saying “be transparent, but only with the things that you are comfortable with being transparent.” As a manager, this is thin ice that we do need to sometimes walk on – and it’s worth taking some time to think about how you want to engage a situation with your team when you know business information that isn’t directly relevant, but it is worrisome. To demonstrate this predicament, Aceto shares a story about how he missed an important meeting with his new boss (CEO of Scotiabank, after a transition in leadership), and while the outcome was okay, he chose to give a “white lie” to his team about it so that they wouldn’t feel let down by him when they got the outcome they wanted/needed. He took a story from talking about culture and appropriate sharing of information, and then turned it into a lesson that leaders need to white lie in order to protect their people? Mr. Aceto – what type of leader do you want to be? One of the hardest things of being in leadership is that you are highly visible. People are looking at you. The kicker is, no matter how much you try to prevent it, you will still make mistakes. Highly visible mistakes. How you respond to those is a large part of what creates the culture in your organization. My willingness to shut down a frustrating conversation with an irate customer with a white lie didn’t help the company, or the customer. It simply helped me get out of a difficult situation. On top of that, it demonstrated to my staff who observed it, that it’s okay to tell customers lies in order to get out of a difficult situation. That is not what I want from my company. That is not what I want from myself. I need to figure out how I want to engage a situation like that in the future that is authentic with my values, and the values of my company. Because if I can’t embody my/our values, there is no way I can expect my team to embody them. Aceto has laid out in his book the importance of honesty, integrity, hard work, and authenticity. But, he blew that all with one chapter, by turning the lesson of facing a failure into an opportunity to prevent sharing difficult information with his team. As a leader, sometimes its hard to face the truth. Often the truth that’s hardest to face is our own “shadow” – the parts of ourselves that we don’t want to admit are there, like our fears, our doubts, and our insecurities. Every person lives with these things. As a manager, if you want to get the best out of your team, you need to create a culture that doesn’t punish people where their shadow comes out, a place where people don’t feel the need to protect themselves from rejection when they aren’t perfect. To be a good manager, you don’t have to learn how to be present to that – many people get work accomplished through fear, intimidation, and control. But, if you want to learn to be a great manager, and a great leader who will inspire and bring out the best in their people, you must create an environment where every employee knows that they don’t have to be afraid to be fully present at work. Do you want to be a manager that hides from difficult truths, or do you want to be one who’s fully open to reality? Previous Depressed managers are impacting your business: what to look for, and how to help them. Next What will you do with your one wild and precious life?